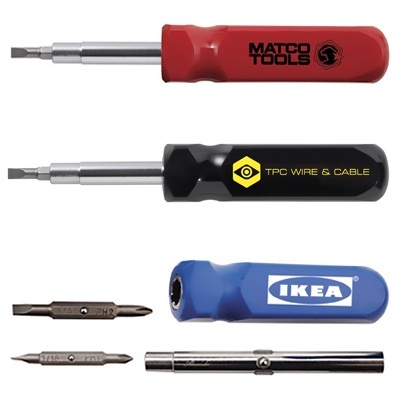 Custom printed promotional 6 in 1 screwdrivers are a useful and long lasting advertising tool that everyone appreciates. Promote your name or business with personalized advertising imprinted on this popular tool or one of our many screwdriver tools. Advertise on this quintessential multi-bit screwdriver. Includes two dual-ended bits (two slotted and two Phillips) and two 0.25″ and 0.31″ hex drivers. Reversible steel shaft doubles as hex driver. Bits store in shaft when not in use. High-impact plastic handle available in three colors: red, blue or black. 6-in-1 Screwdriver is 7″ long x 1″ wide. Custom imprint area on handle is 2″ long x .63″ high with optional second side imprint (for an additional charge). An additional $55 non-refundable artwork charge per custom imprint position and color must be paid before work can begin. For pricing on multiple locations or more than 1-color, please contact us at 706-374-0710 for pricing.